The surface of Mars is not only inhospitable to life as we know it, it's also a rough place for molecules themselves to survive. Mars has a very thin atmosphere compared to Earth, and this means there is little to stand in the way of the harsh solar and space radiation that pummels the surface. This radiation can quickly cause molecules to decay. However, ice on Mars could help shield molecules from radiation, and the deeper the molecules are buried beneath the ice, the longer they survive. Because of this, the best places to search for organics and biosignatures on Mars could be at the poles or other areas where ice is present. "Our goal is not the polar caps per se," said Chris McKay of NASA's Ames Research Center and co-author on the study. "Our goal is ice-cemented ground." According to McKay, another location that the researches are considering is near the Viking 2 landing site, where a separate study by Bryne et al. (2009) revealed that the ground is cemented together by ice near the surface. "The ice-cemented ground is of interest for two reasons," said McKay. "Firstly, it's possible that during periods of recent high obliquity the ice was warmed and became as habitable as the soils in the Antarctic dry valleys. Second is the hypothesis that ice cement protects organics and biomarkers." The difficultly of such a mission is in getting under the ice to collect samples. The Icebreaker team believes that drilling is the most realistic method to use for this purpose. "We've tried other methods such as adding vibration or percussion to scoops and melting ice," said Gale Paulsen of Honeybee Robotics and another of the study's authors. "In the case of vibrating or percussive scoops, they are unable to penetrate ice-bound soils, especially at temperatures of -20ºC or less. Pure melting of ice is constrained to formations that are almost entirely ice (little soil and rocks present) and requires a significant amount of energy to prevent refreezing of the ice." Although drilling on another planet is complicated, it remains the most mature technology available for collecting the type of samples astrobiologists need. "We can't be 100 percent sure on the exact differences between drilling martian ice and martian soil," said Paulsen. "No drilling has been done on Mars to depths of more than a few centimeters, and we have never had the opportunity to do a direct comparison between the different formations on Mars." To this end, the Icebreaker team has been testing equipment on Earth in a range of conditions in order to understand what will be required for deep drilling in ice-cemented soil on Mars. "We can attempt to simulate the martian environment on Earth by using vacuum chambers and testing in various analog environments," Paulsen said. "From testing in chambers and in analog environments we have learned that there are really several differences between drilling in ice, ice bound soils, and dry soils (that are) mixed with rocks of various sizes." The biggest complication that ice adds for drilling on Mars is melting and re-freezing. Paulsen explained that it is incredibly important to make sure that the ice is not melted during the drilling process. If this happens, it can quickly re-freeze, fusing the drill bit in place. If a drill becomes jammed in place while working in the laboratory, human engineers can retrieve it. Of course, that is not the case on Mars. "The bonding strength at such cold temperatures is stronger than concrete, which makes it almost impossible to recover the drill bit if this occurs" said Paulsen. 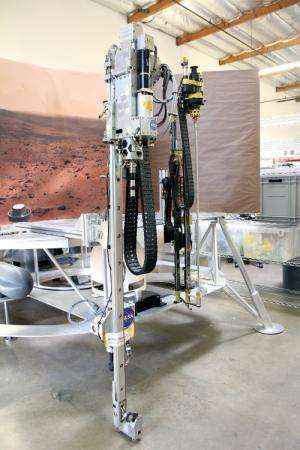 Laboratory and field tests of the technology allowed the team to identify potential problems that could arise when using the drills on a distant location like Mars. In 2011, the team created ice layers coated with a simulated Mars soil in a large vacuum chamber to simulate conditions on the surface of Mars. The Icebreaker drill was then put inside and drilled three holes, the deepest reaching 30 centimeters. The tests worked well, with the drill making slow headway through the ice and returning clumped and powdery drill cuttings to a sample scoop. The team also needed to see how Icebreaker operated outside the laboratory. 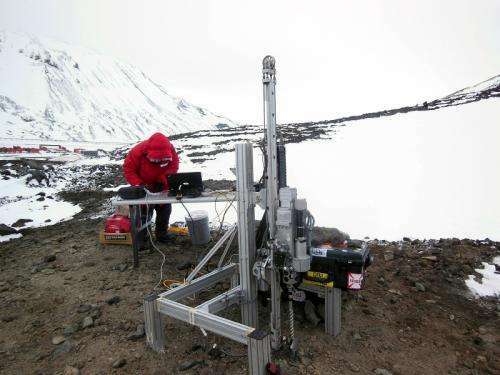 The team tested the automated drills in the field in both in the Arctic and Antarctic. The expeditions allowed them to study drill operation, and the ability to control contamination of the samples that were collected. Because we do not know if life ever existed on Mars, it is absolutely essential that a drilling mission would not introduce contaminants into the martian subsurface. The mission would fall under one of the strictest categories outlined by international agreements for planetary protection (see sidebar). 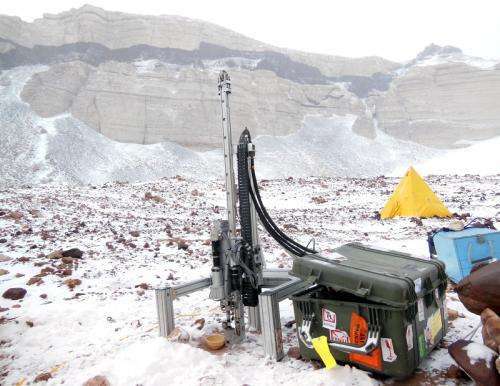 The drill proved capable of breaking through the varied, ice-cemented ground in Haughton Crater in the Canadian Arctic. The deepest hole that Icebreaker drilled was an impressive 2.08 meters. Is that deep enough to hunt for biosignatures on Mars? "We really have no idea," said McKay. "Curiosity drilled a few centimeters. How this works going deeper is just speculation. My current thought is that, in the ancient sediments, we would need to be 5 meters deep. This is set by radiation activated perchlorate destruction. In locations where there is recent habitability, the requirement could be much less. In ice-cemented ground it might be just deep enough to get well into the ice-cemented ground." Importantly, the field tests also showed that the mission could cope with jamming during the drilling process. When the drill bit became stuck, it was able to recognize the problem, lift the drill up, and then try again until drilling could be resumed. This is an extremely important accomplishment for an automated drill. Because of the lengthy time it takes to communicate between the Earth and Mars, the mission wouldn't be able to rely on humans to tell it when it was stuck, and how to get unstuck. The delay would mean that a drill would keep running, even if it wasn't making any progress, and would likely burn out its motor or break the drill bit. "The biggest complication is the time lag between other planets and Earth," said Paulsen. "In most cases this delay is too long to enable tele-operation. This means, the drill must be smart enough to perform a number of tasks autonomously. This includes drilling without melting ice (i.e. monitor the formation temperature or conductivity while drilling) and also monitoring how much force is on the drill bit and/or auger (device that removes cuttings) and make various decisions based on the information received (i.e. pull the drill bit out to clear cuttings from the hole)." In order to get an idea of how Icebreaker would work on a Mars mission, the team simulated the time lag in communications when operating the drill remotely. 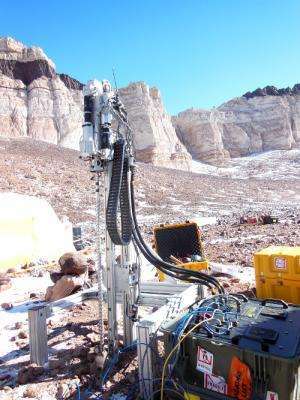 During tests in Antarctica's University Valley, the drill was operated at times from the NASA Ames Research Center in California. Icebreaker's automation wasn't perfect. In Antarctica, the drill became stuck at a depth of 1 meter in its third borehole, and the mission failed to retract the drill. The team had to manually retrieve the equipment by drilling adjacent holes by hand. Another problem arose when cuttings from the drill, which were partially melted and then re-frozen, formed a wedge above the drill bit at the bottom of the drill. Additionally, sample cutting accumulated around the outside of the borehole and blocked the sample transfer scoop, leading to cross-contamination as debris fell back into the borehole. These issues highlight the importance of testing mission components in Mars analog environments on Earth. Even seemingly simple issues, like the build-up of drill cuttings around the borehole, could compromise the scientific objectives of a mission. But after their recent work in the field, the team now believes they have enough data to prepare Icebreaker for a trip to Mars. With support from the ASTID and ASTEP elements of the Astrobiology Program, they have developed a second generation of Icebreaker that has one-quarter the mass of their first attempt, bringing the weight down to 10 kilograms. "Functionally, the baseline design is ready for flight," said Paulsen. "This means it meets mass, volume, power and energy requirements and margins." Paulsen did point out that there is still a lot of testing to be done in order to qualify the designs for a trip to Mars. "This includes thermal cycling, life testing, and testing on vibration tables to make sure the drill will survive launch loads," said Paulsen. "These tests all need to be done for the Icebreaker drill, along with more testing of the control software. All of these items could be complete within 1 to 2 years if a mission requires this, and if funding enables completion of these tasks." What in the Solar System is COSPAR Category IV? 'Planetary protection' is a major component of any mission NASA builds. Whenever we send a robotic explorer to another world, microorganisms from Earth like to hitch a ride. This is a major point of concern for astrobiology missions, because scientists must be absolutely certain that any life they might detect in samples on another planet isn't simply a microorganism we accidentally brought with us. In addition, any life that might exist on other planets must be protected from contamination by Earth organisms. We don't want to discover an alien ecosystem on a planet or moon, and then introduce bacteria that could destroy it. Similarly, for any mission returning samples to the Earth, it's important to prevent backward contamination on our own planet. Long before the Space Age was a reality, scientists were considering planetary protection. When the Soviet Union launched the first space probe, Sputnik, the International Council for Science (then the International Council of Scientific Unions) quickly began introducing quarantine standards. The US National Academy of Sciences also released its own recommendations. Issues of contamination are also included in the United Nations Outer Space Treaty, which was entered into force on October 10, 1967. Article IX of the Outer Space Treaty outlines the obligations that space faring nations have when launching a mission beyond the Earth. "...parties to the Treaty shall pursue studies of outer space including the Moon and other celestial bodies, and conduct exploration of them so as to avoid their harmful contamination and also adverse changes in the environment of the Earth resulting from the introduction of extraterrestrial matter and, where necessary, shall adopt appropriate measures for this purpose." In terms of planetary protection, NASA follows the guidelines set out by the Committee on Space Research (COSPAR). This international committee was established in 1958 by the International Council for Science. Missions are classed in categories based on factors such as where they are headed (i.e. Mars, Europa, the Moon, etc), and what the nature of the mission is. One big consideration is whether or not the mission will come into physical contact with a planet (like a lander or rover), or if it is just orbiting the target from a distance. There are also special sub-categories for missions that search for biosignatures, or those that land in regions of a planet where water might be present. Category I - Missions to locations that are not thought to be places of interest in terms of chemical evolution or origins of life. Nations are pretty much free to visit these places without documentation. Category II - sites of 'significant interest,' but with a remote chance that contamination could jeopardize future exploration. Category III – Missions that fly by or orbit a body of significant interest, and where contamination would jeopardize future exploration. Category IV - landers and probes to the surfaces of planetary bodies of significant interest, or for which contamination would jeopardize future exploration. These missions have to be thoroughly documented, with strict cleanliness requirements. If it's a sample return mission, the 'return' portion of the mission is considered category V.
Category V – Earth return missions. If samples are brought back from a location with no biological concern, they're considered 'unrestricted.' However, if you're carrying materials from a location like Mars, where questions still remain about native biology, there are a lot of additional rules about how long the samples must be quarantined and tested to make sure they're not hazardous to Earth. Mars is considered a target of significant interest for life, and Icebreaker would be touching down on the surface. It would therefore be considered a Category IV mission. And because Icebreaker would actually be drilling below the surface, into a site of specific biological interest, extra precautions would be required to ensure the drill and sample-handling instruments were sterile.